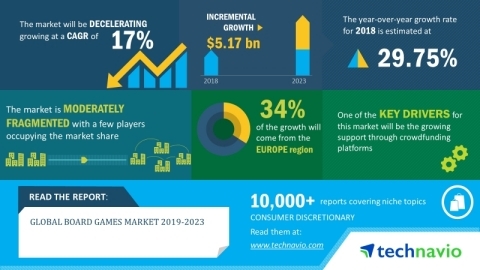 LONDON--(BUSINESS WIRE)--The global board games market 2019-2023 is expected to post a CAGR of close to 17% during the forecast period, according to the latest market research report by Technavio. However, the market’s momentum will decelerate in the coming years because of the decrease in year-over-year growth. To assist the smooth movement of board games across their entire product lifecycle, crowdfunding platforms are partnering with manufacturers and distributors. Moreover, these platforms also secure funding for potential board games developers from the general public. Crowdfunding platforms enable board game developers to assess the market demand for their product by giving them more control over their creation. With crowdfunded board games becoming increasingly successful, more independent developers are entering into the market, thereby boosting growth. This market research report on the global board games market 2019-2023 also provides an analysis of the most critical trends expected to impact the market outlook during the forecast period. Technavio classifies an emerging trend as a significant factor that has the potential to significantly impact the market and contribute to its growth or decline. Augmented reality is highly adopted in board games to enhance the gamer’s immersive experience. The advent of AR designing tools allows game developers to design games entirely in augmented reality without using any real-world technique. This enables game publishers to add features such as animations and sound effects to board games, which enhances the appeal factor among gamers. Moreover, AR bridges the technology gap in board games which results in its high adoption among gamers, positively impacting the market. “Hologrid: Monster Battle merges board game action with highly immersive visual effects by using augmented reality compatible character cards. This board game uses a combination of cards and a smartphone camera to make the cards appear as monsters. With the use of AR, Hologrid: Monster Battle is expected to create massive appeal and fan following for itself among gamers,” says a senior analyst at Technavio. This market research report segments the global board games market by product (tabletop, card & dice, and role-playing), distribution channel (offline and online), and geographical regions (APAC, Europe, North America, MEA, and South America). Europe led the market in 2018 with a market share of more than 37%, followed by North America, APAC, MEA, and South America respectively. The dominance of Europe can be attributed to the presence of classic board games based on economy-related themes.